Thanks so much to Yolanda for having me on her blog for this awesome event! As a reader and author of IR/MC fiction, I’m always excited to help spread the word about the genre, meet my fellow authors and add new books to my reading pile. I came into romance later than most readers of the genre. I started out loving sci-fi, fantasy, thrillers and suspense. I first started writing horror stories and some dark sci-fi stories that finished with some pretty downer endings. Definitely not HEAs! Later on, I began to write some lighter work and explore more of the emotional side of storytelling. That’s one reason I love the romance genre. The fast paced action books like their movie counterparts kept me on the edge of my seat and the thrilling characters made me root for them to get the baddie in the end. As a fan of La Femme Nikita, The Professional, Strange Days, The Terminator movies, Blade Runner and so many more action flicks, I wanted to see more heroines like me right in the middle of the action. Over the course of my writing career, I raked up a ton of unpublished stories that never saw the light of day (some that never will *smiles*) but a few that did. One was my romantic suspense novel Before Dawn Breaks (to be re-released this July), my screenplay turned novel Wild Manhattan (now called The Comfort of Strangers – Coming this May) and my upcoming action suspense thriller On the Cut (Coming this Summer). For a long time, I thought the only thing readers wanted was contemporary romances. Although I liked reading them, contemporaries were the go-to popular romance stories. It wasn’t my forte, but still I decided to hop wholeheartedly into learning more about them and getting to love them. In the back of my mind, I still wanted to write the action, suspenseful, noir and speculative works that were my true passion. As time went on, I felt like a square peg trying to fit myself into a circle. I wanted to garner a large reading base but at the same time, I wanted to write what I loved. 2014 was my year. After taking a hiatus to get married, move across country (not once, but twice in the same year) I wanted to make some changes in my professional life as I had in my personal one. Now, as I’m ready to hop right back into the writing foray once again, I’m excited to bring out some books that are close to my heart including the last in my Ashen Twilight series and a brand new, spiffy romantic suspense that I’m excited to post as a cover reveal right here. I may be a bit of an outlier not only in romance but also IR romance. My stories may not be traditional but I love writing them and, who knows, there may be some readers looking for what I like to read and write. And that’s what makes the writing experience all the more rewarding for me. Enter now until May 31st to win a $30 Gift Card to the online bookstore of your choice PLUS a book of your choice from my backlist! Just leave a comment below telling me what you love about multicultural and interracial fiction. Thanks for stopping by! Open only to those who can legally enter, receive and use an Amazon.com Gift Code or B&N Gift Code. Winning Entry will be verified prior to prize being awarded. No purchase necessary. You must be 18 or older to enter or have your parent enter for you. The winner will be chosen by rafflecopter and announced here as well as emailed and will have 48 hours to respond or a new winner will be chosen. This giveaway is in no way associated with Facebook, Twitter, Rafflecopter or any other entity unless otherwise specified. The number of eligible entries received determines the odds of winning. Giveaway sponsored by the author. VOID WHERE PROHIBITED BY LAW. Posted on May 16, 2014 by yolandaashton. This entry was tagged Adult Contemporary Romance, Multicultural, multicultural romance, multicultural romance blog-a-thon, Rae Lori, Yolanda Ashton. Bookmark the permalink. It is always great to see diversity in the book world! Greetings Rae, Nice to meet you! I’m sorry to say, I haven’t read any of your work. I’m changing that now. I agree we should always be true to ourselves no matter what! Kudos to you. I’m a huge, huge fan of romantic suspense with alpha males and strong capable women. I like watching the hard fault dance to the HEA. 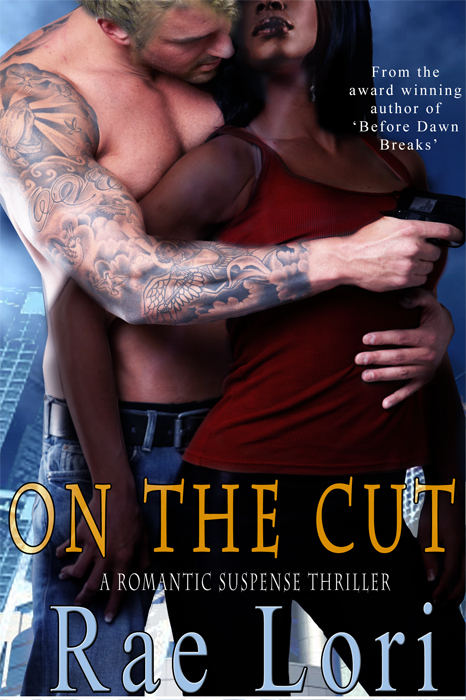 The cover of On The Cut is HOT! I’ll look forward to the release this summer. I’m sure the storyline will be engaging. Again, thanks for the opportunity to learn more about you. Take care! Thanks for entering and dropping by! First of all I want to state that I support diversity in the field of writing especially fiction and literature. Without authors writing from their hearts and sharing their stories our lives would be void of the voices of different cultures. I think it is important that we raise our children by reading books such as these in our homes and in the institutions. Our children’s lives will become rich with the voices of others speaking to them from the pages of books. I personally read many books in my homeschool aloud and I believe this helps my children to learn about other cultures and places around the world, even history! We need these voices to inform us of different cultures and time periods so that our children can be well rounded individuals. This in and of itself is not the only aspect that can help children become well rounded and open minded. Although it plays a large portion in helping them to branch out into meeting new people from different cultures. Just for the record when I was a teen I read many romantic novels! I love reading diverse stories, because I think it allows the reader to glimpse something that may not be normal to them in a way that doesn’t scream hear learn something. Looking forward to your latest book! I love MC and IR books because they reflect the world. Love comes in all colors and combinations! Wow. That is what I thought when I read Rae Lori’s words: I felt like a square peg trying to fit myself into a circle. I wanted to garner a large reading base but at the same time, I wanted to write what I loved. That is *really* how I feel. I love IR, but I also love other romance genres. Recently, I declared I would write all romance, as how I’ve defined it –> true-to-life with a dash of fiction romance (lol). Who will read it? Don’t know, but I do know like Ms. Lori shared I can no longer fit my square peg writing into a circle. I’ll just make my own, and that’s what I see IR/MC authors doing by telling love stories about lovers we normally don’t see paired together. Write on, Sanshika! From one square peg to another, I’ll be cheering you on from the sides and looking forward to your work. It sounds right up my alley. 🙂 Thanks for dropping by! Thanks for dropping by and reading, BN! Thanks to all for dropping by! There is 4 more days left to enter so tell your friends and fellow book lovers to hop on down and enter! If you’d like an excerpt of On the Cut, don’t forget to leave your email addy. 🙂 All entries get a goodie! this is my second time trying to leave a comment because WordPress is such a pain in the you know what. I can ever remember the stupid password because they make it be more secure than 12 banks even. Ok back to the question at hand 🙂 I like diversity simply because I feel that it shouldn’t matter the color of anyone skin and that people are the same around the world. I think having more diversity encourages change and helps people see how silly they can be. Glad your comment made it in this time, Madonna! Some of these sites have nutty password protectors indeed!